Tasmania's shy albatross population is in trouble. Climate change is taking its toll on the fragile breeding cycle of these giant birds. Every year, nesting season brings these travelling seabirds home to a tiny 18 hectare patch of rock off the west coast of Tasmania, known as Albatross Island. Shy albatross return to the same place to mate and nest every year and will lay one single egg, which they watch over and nurture. Sadly, increased air temperature and rainfall on the island during the incubation and chick rearing period mean fewer are surviving to adulthood - putting future populations at risk. 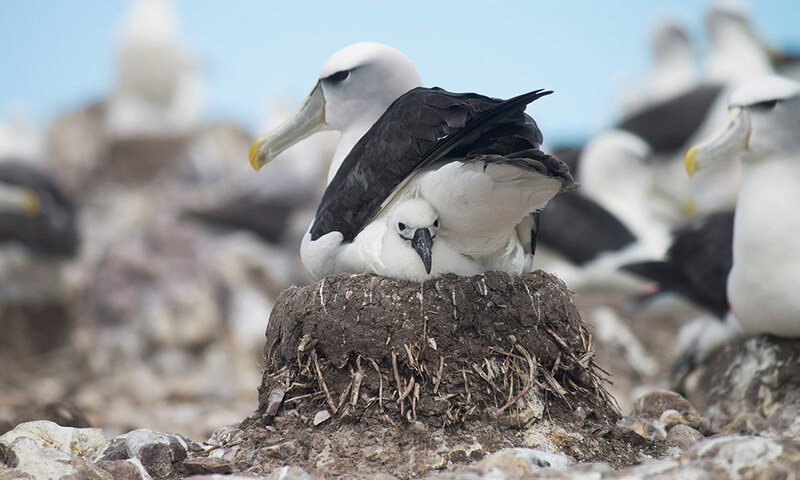 To protect the species, WWF-Australia is collaborating with the Tasmanian Department of Primary Industries, Parks, Water and Environment (DPIPWE), Tasmanian Albatross Fund, and the CSIRO to install artificial nests in an effort to increase the number of surviving chicks. This week’s gallery shows the initial stages of this exciting project. The first expedition was back in August to install the nests and then a follow up expedition happened last week to see if the shy albatross had taken to their new nests. This is Albatross Island. It might look like one big bare rock, but it’s actually home to 10,000 shy albatross who come back every year to find their mate and lay a single, precious egg. The island is only accessible by helicopter and that’s very much dependent on the weather. Many hands make light work, as the team unpacks the first crate of freshly made artificial nests on the island. There are two types of nests. One is made out of concrete and the other clay. This season we’ll be testing to see which nest is the most effective. These artificial nests are ready to be installed at the south colony nesting ground, where birds have already arrived for the breeding season. Albatross are faithful to nesting sites, returning to the same one year after year. Not all birds can find and keep nesting material to make their own high quality nests - this puts the eggs at risk of exposure and not making it to term. A disgruntled shy albatross looks on while Dr Rachael Alderman (DPIPWE Marine Conservation Program - Team Leader) installs an artificial nest by packing mud and rocks around it. Dr Kris Carlyon (DPIPWE) introduces a curious shy albatross to the artificial nest. This male albatross, with mud on his chest, has already started adding new material to the nest to personalise it and get it ready for an egg - a good sign! 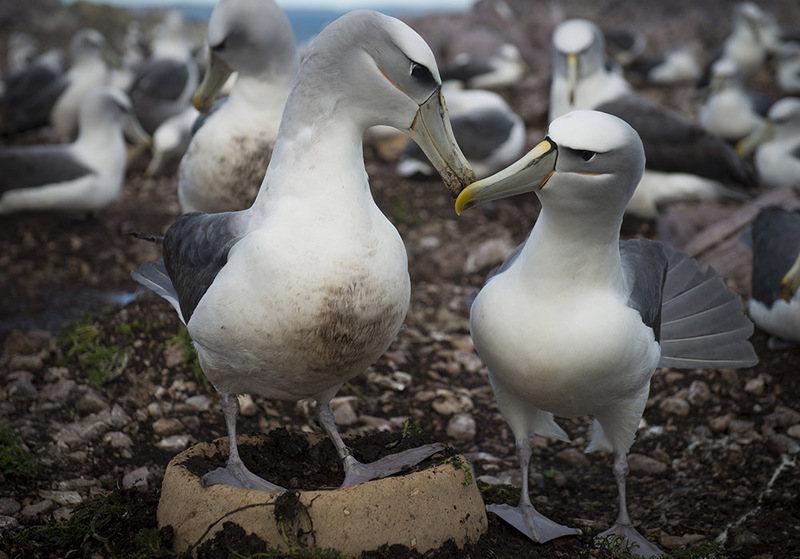 This pair of shy albatross have just reunited for the breeding season next to their new nest. They’ll continue to court, mate, and work on their nest until the female lays a single egg. Last week, when we returned to the Island, we saw some promising signs! Eggcellent results! We’ll return in a few months to see how the chicks are faring and if the new nests were successful. 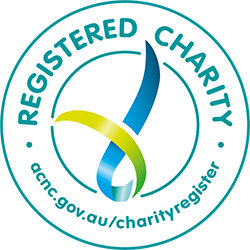 Funding boost to ensure the survival of the Tasmanian shy albatross in the face of climate change.